Tributes flowed on Sunday as New Zealand mourned the death of All Blacks great Colin Meads at the age of 81 following a battle with pancreatic cancer. 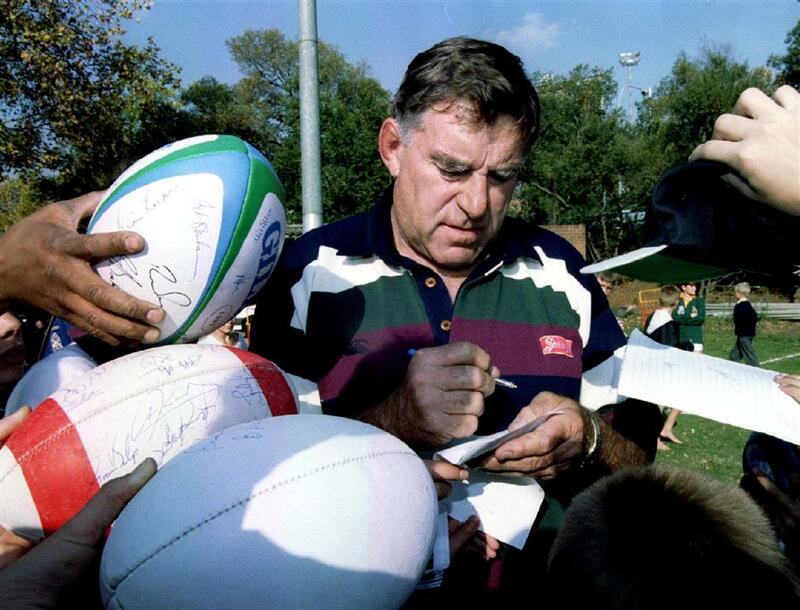 New Zealand's team manager Colin Meads signs autographs for school children as the All Blacks visit Wanderers Stadium in Johannesburg, South Africa, ahead of Rugby World Cup, in this May 19, 1995, photo. Colin Meads, a famously tough All Blacks lock hailed as New Zealand's greatest rugby player of the 20th century, has died after a year-long battle with cancer. He was 81. Verna Meads said her husband had been diagnosed with pancreatic cancer last August. Meads played 55 tests among 133 games for New Zealand between 1957 and 1971 — a number thought prodigious in an era in which the All Blacks seldom played more than four tests a year. Hardened by his life as a sheep farmer in the rugged King Country district of New Zealand's North Island, Meads was endowed with great strength, stamina and toughness. He famously once played an entire match with a broken arm. Prime Minister Bill English said Meads' death was "a great loss to New Zealand". Meads "represented what it means to be a New Zealander. He was no-nonsense, reliable, hardworking, warm and very generous with his time", English said. "I remember when I was younger hearing stories about how he used to shear sheep all day and go running at night. I thought I'd give it a go. I quickly learned the Meads legend was built on physical and mental toughness." At 1.92-meter tall and weighing 100kg, Meads was considered a giant in rugby at the time, though he would be small for a lock by modern standards. Meads was nicknamed "Pinetree" by teammate Kevin Briscoe during a tour to Japan by a New Zealand under-23 team in 1958 and the sobriquet stayed with him for the rest of his life, seeming to epitomize his stature and indomitability. His son Glynn, an able rugby player, was known as Pinecone. Meads was regarded as New Zealand's greatest All Black, even when players of the modern era such as Richie McCaw, who played 148 tests, surpassed his record for test appearances. He was widely considered to embody the best qualities of an All Blacks player: he was tough, uncompromising, loyal and humble. In a relatively young nation he also helped to define qualities which were seen to be essential to the New Zealand character. His humor, simplicity and self-deprecating nature were much admired. Meads played at a time when rugby was an amateur game and, having to leave his family farm to travel with the All Blacks on tours which were often several months in duration, he experienced financial disadvantage to represent his country's most famous team. He was a man of the soil at a time when many All Blacks came from rural and farming backgrounds, before urbanization greatly changed New Zealand's demographic makeup. Meads stayed on his farm near the small township at Te Kuiti until his death. In June, a bronze statue honoring him was opened in the Te Kuiti town center and he was present at the unveiling, his last public appearance. "Dad led a full life. He loved being an All Black and he loved his family dearly," Meads' youngest daughter, Shelley Mitchell, said in a statement released by the family. "We will miss him terribly." Colin Earl Meads was born in 1936 at Cambridge in Waikato province but his family moved soon after to the farm at Te Kuiti, where he spent the remainder of his life. He played for the tiny Waitete club and for King Country province. His loyalty to those teams never wavered and as great as he became — he amassed 139 appearances for King Country among more than 360 first-class games. Meads made his international debut against Australian in 1957, playing his first tests at flanker and No. 8 before assuming his regular position in the second row. His selection in that position was almost unchallenged for the next 14 years. He was part of one of New Zealand rugby's greatest eras and his contemporaries included players such as Ken Gray, Brian Lochore, Wilson Whineray, Waka Nathan, Don Clarke and Kel Tremain. The undefeated 1967 team with which he toured Britain was recently voted the best New Zealand has ever fielded. Meads had a reputation as an enforcer at a time — in the absence of video replays — when physical violence was more common in rugby. He became only the second All Blacks player to be sent off in a test match, against Scotland in 1967, though he was considered unlucky in that instance. He was held responsible by many Australians for ending the career of Wallabies scrumhalf Ken Catchpole in 1968 when he wrenched his leg at a ruck, causing a serious injury. Meads captained the All Blacks in 11 tests and formed a formidable locking partnership with his brother Stan, who played 15 tests at his side. He retired from international rugby in 1971 after captaining a young All Blacks team to its first ever series loss to the British and Irish Lions. He went on to coach and manage teams and was an administrator at provincial and national level. But he displeased the New Zealand Rugby Union in 1985 when he managed a rebel Cavaliers team, featuring many All Blacks, which toured South Africa in breach of boycotts in the apartheid era. He was a popular and prolific after-dinner speaker. With a pint of beer clutched in one hand Meads would regale audiences with droll recollections of his career and pithy observations on the state of the modern game. His biography "Colin Meads, All Black" was the best-selling sports book domestically of its time. Meads is survived by wife Verna and their five children Karen, Kelvin, Rhonda, Glynn and Shelley, their 14 grandchildren and seven great grandchildren.